Environmentalism + fashion? Stick with me here… The other week one of our customers was deciding between a cashmere Repeat sweater just shy of $200, and a cotton Julie Brown cardigan around $80. She loved the cashmere sweater, but was not sure if she wanted to spend the $200. Then, she told me of an article she recently read about how we should invest in better pieces of clothing that will last longer and reduce the amount of clothing and textile waste we produce each year. It got me thinking, why not get the most out of each piece of clothing we own, and use it for many occasions? This Lucky Brand scarf print dress is what I affectionately refer to as a “throw-and-go” dress – you can throw it on with sandals and simple jewelry and run out the door. For a casual day of errands, kid’s sporting events, or brunch with a friend, pair this dress with the Jack Rogers Maci sandal and an easy catch-all bag. While turquoise is not the primary color in the pattern, I love pulling this gorgeous color out with the Donna Si necklace and Trades bracelet. 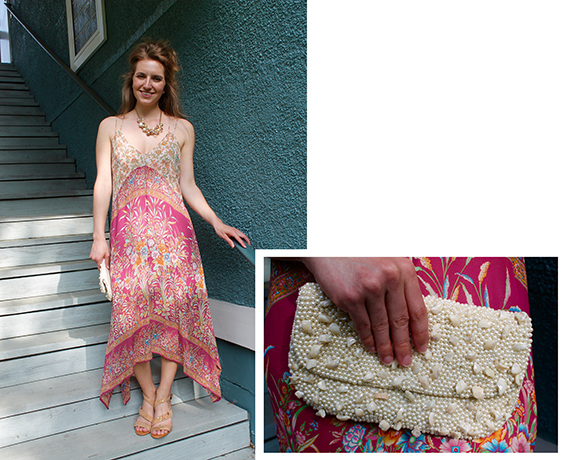 If you are heading out to dinner that night, no need to dirty another outfit! Swap out your shoes for the Johnston & Murphy Stacy Asymmetrical cork strappy heels and your bag for this Moyna raw stone clutch. Top it off with the sophisticated Lenora Dame necklace, which adds a beautiful mixed metallic touch (which, if you have not heard, is On Trend right now!). Have you ever been invited to an event that is “dressy casual”? I have, and boy can it be tough to figure out the perfect blend of dressy and put together, without being too dressed up. How fun is this orangey-coral color?! This Britt Ryan Racerback dress is a staff favorite and great to take on vacation for an easy dinner out. Pair it with the Maltese gold metallic sandals for comfort on the go! Contrasting colors are all the rage right now – we love pairing a bold turquoise bracelet with reds and oranges for a complementary look! For a chic look, swap your turquoise jewels for a monochromatic look with gold tones. We again love the Johnston & Murphy Stacy Asymmetrical cork strappy heels for a unique look that elongates your legs. The muted finish on both the gold chunky cuff and bronze druzy pendent necklace add sparkle without going over-the-top. You are sure to wear both of these items over and over again. Next time you are out shopping and in search of the perfect sweater, dress, or pair of pants, think about all of the other ways you can wear that piece – be an environmental shopper!